The Chuck Taylor high top: a true classic that never gets old. I often wear clothes that don’t match. I often go too long without shaving. I’ve never in my life bought or owned anything from Abercrombie & Fitch. So, on the outset, it might seem like I know nothing about fashion. This is true. But I do know this: chucks are cool — damn cool. It truly is a shame most people do not even know what chucks are. For those of you not “in the know” about stylish footwear, you can find chucks at pretty much any radio station, rock concert or computer lab. Some people call them “Converse All-Stars,” but for us purists, they will always be chucks. So, before I allow this to develop any further, here is a brief history of the shoes known as chucks. As with most things, it all started in the Midwest back in the 1920s. An All-Star basketball player named Chuck Taylor decided he needed something a bit more comfortable on his feet while he ran up and down the court. He finally settled on the Converse All-Star basketball shoe. His love of the shoe was so intense, he soon marched down to the Converse office and got a job promoting his favorite footwear. Two years later, the design of the shoe was slightly modified and it was renamed to include his moniker. Taylor spent the rest of his life driving up and down the East Coast promoting his namesake shoe. He eventually knew every basketball coach in the country and had most basketball players wearing his name on their feet. Deservedly so, Chuck was eventually elected to the Basketball Hall of Fame and the much-coveted Sporting Goods Hall of Fame. So why is it that after 80 years, chucks are still so popular and so cool? It really is quite astounding. After all, the Air Jordan is currently on its 16th reincarnation. Those shoes that I had in elementary school with the little air pump in the tongue haven’t been made in years. And thankfully, I haven’t seen those shoes with the blinking red lights around in the past few years. Even though I have for some time been well-aware of all the reasons why not to wear chucks, I will admit I have nonetheless worn them on-and-off for the past seven years or so. I got my first pair in seventh grade, because it was the cool thing to do, I guess. I wore them for at least a year, until the end of my eighth-grade year, when I finally replaced them. I remember feeling almost shameful the day I showed up at school with regular sneakers; chucks had become an institution in my life. Days and years went by. Through much of high school, I didn’t think a lot about shoes. Eventually, senior year arrived, senioritis kicked in and I had a bit of a revelation. My generic Nikes treated me well through freshman gym class, but I knew they were lacking something: simplicity. During my first three-and-a-half years of high school, my life had become so complicated I had forgotten about the simpler things. Before long, I took it upon myself to go to Foot Locker and buy a brand new pair of chucks — after all, at $32, the price was still right. I thought briefly about buying the new version of the Chuck Taylor All-Star, which Converse had put on the market a few years back. Then I laughed at the very idea of Converse trying to reinvent the chuck. Don’t they know that a true classic never gets old? At the time of my purchase, my grandparents happened to be visiting from Florida. My grandmother saw my new shoes and looked at me in astonishment. “Do you realize that people wore those same shoes when I was in high school?” Rather than being ashamed of taking fashion cues from my grandparents’ generation, I felt quite proud — to be part of a great piece of Americana. Sometimes people will see chucks and laugh at the thought of wearing 80-year-old shoes. Other times, people will smile and nod in awe and acknowledgment of the Chuck Taylor legacy. That legacy, of course, is one that transcends everyone from industrious basketball players to wannabe middle-school kids to upbeat urban Gen-Xers. 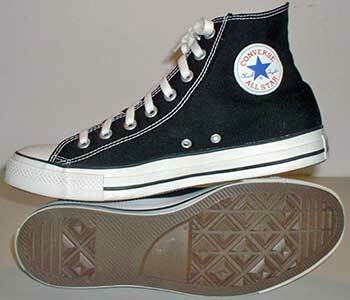 It is a legacy that has resulted in the production of about a half billion chucks in the last century. The legacy is still far from dead, as chucks can now be purchased on the Internet in dozens of colors and varieties, including leather, plaid and — as a sign of the times — cargo chucks. Due to my severe case of athlete’s foot, it is unfeasible for me to wear my chucks on a daily basis. I just keep them in the back of my closet for those days when I decide I’d like to actually be able to feel the ground that I’m walking on with the bottoms of my feet. It’s nice to know that, in a busy world of cell phones and Palm Pilot organizers, all I need to do is reach to the back of my closet and put on a pair of shoes to remember the simpler things in life.